What I do know for sure is that my wall doesn’t have to carry any weight at all. It’s going in a place that is currently wide open, and that area is supported by a load-bearing beam in the attic. I’m so glad! So none of this is actually structural as far as needing to carry any type of load from the roof. It needs to be sturdy enough so that if people lean on it or sit on it, it’ll be strong, but that’s it. Other than that, it’s strictly a decorative wall to give some architectural interest and define the two spaces. 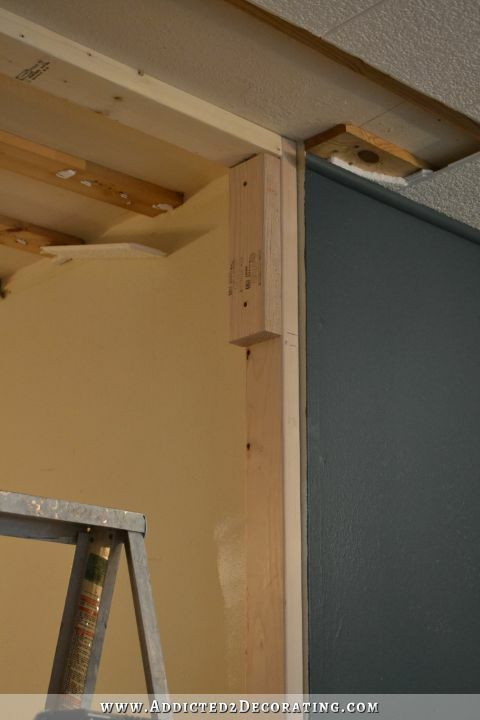 All of that to say that if you’re wanting to open up a wall in your house and add pony walls and columns, please check first to see if it’s a load-bearing wall!! If it’s load-bearing, your process will be much different than mine. But here’s what I’ve done on mine so far. 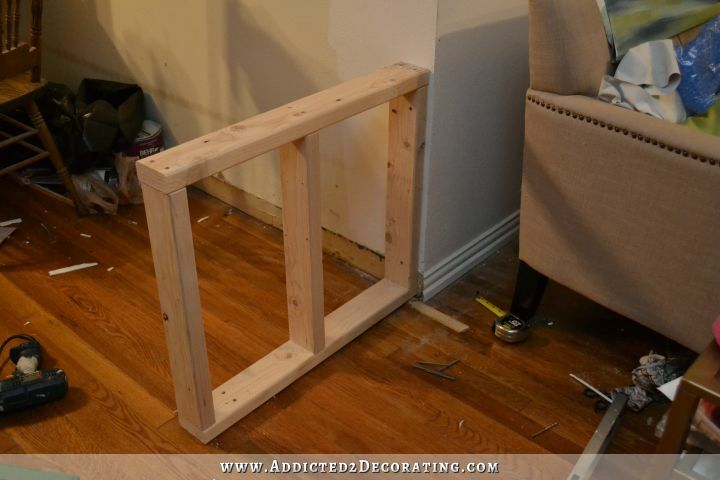 I started out by building two frames for the pony walls. I decided to make my pony walls about 25 inches high, and 30 inches wide. 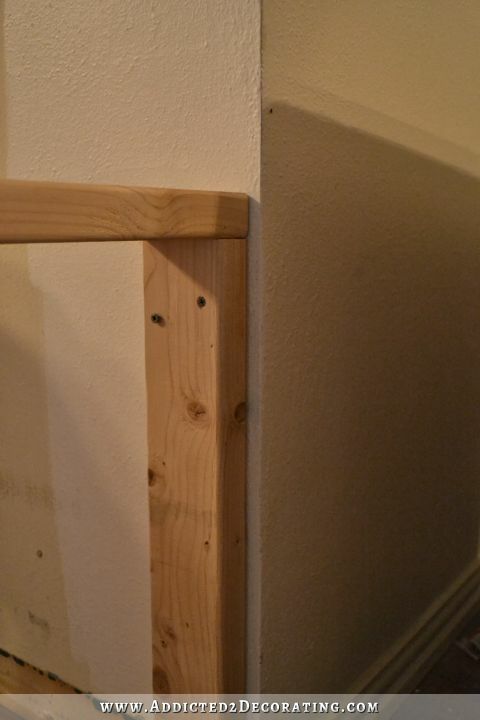 I used 2 x 4 lumber, and put them together using wood glue and 3-inch screws. Then I placed it against the wall and screwed it into the wall using 3-inch screws. 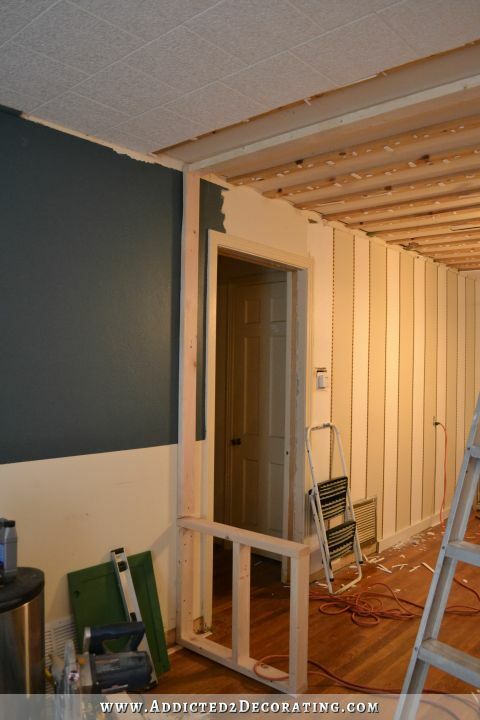 My walls have shiplap underneath the drywall, so fortunately I didn’t have to worry about finding a stud. I did have to shim one side just a bit to get it perfectly level. After screwing it to the wall in three places, I made sure it was square with the perpendicular wall and screwed it into the floor. I repeated that step on the other side, using a 10-foot piece of lumber, as well as my tape measure to measure for placement, to make sure that the two pony walls were even with each other. Next I placed a scrap piece of MDF board on top of the pony wall to use as a spacer since I was going to use 3/4-inch MDF to finish off the tops of the pony walls. Then I cut a piece of 2 x 4 to go from the top of the spacer all the way to the ceiling. I screwed the 2 x 4 in place on the wall after checking to be sure it was plumb. And then I repeated that step on the other side. 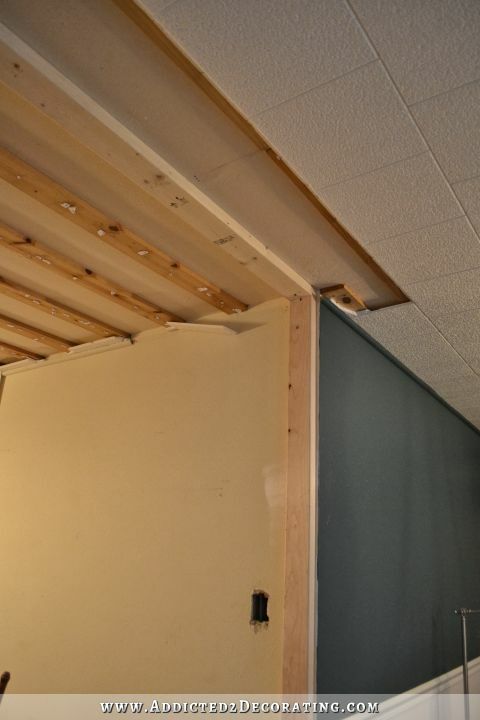 Next I cut a piece of 2 x 4 to span the width along the ceiling, and I screwed that into place, making sure that the screws went into the ceiling joists. 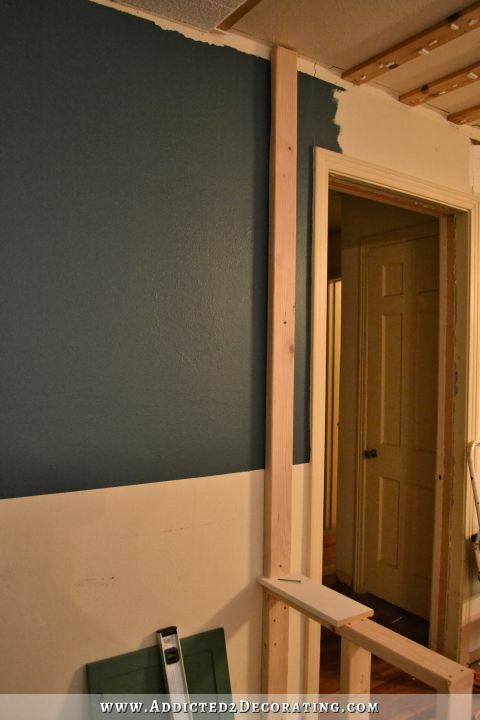 And of course, that 2 x 4 went all the way from one side to the other, right in between the vertical 2 x 4’s that I had just attached to the walls. Next I cut a 2 x 4 to serve as a spacer. All of my doorways are 82 inches tall, and I wanted this one to be the same height. So I measured how long the 2 x 4 spacer needed to be in order to give me an 82-inch-tall opening. I repeated that process on the other side. Then I used a small scrap of 2 x 4 and screwed it into the vertical 2 x 4 with a space above it just big enough for a 2 x 4 to fit in there. The reason I did this is because, as usual, I was working alone and didn’t have an extra set of hands to help me hold the 10-foot-long 2 x 4 in place while I screwed it into place. So I temporarily screwed that scrap piece on there to act as my second set of helping hands. That way I could put my ladder on the other end (on the right side), lift the 2 x 4 and slide it into place above the temporary brace on the left side, while holding it and screwing it into place on the right side. 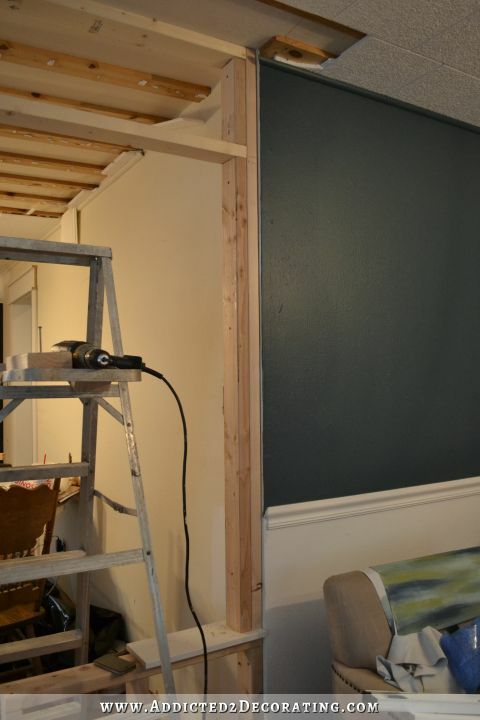 Then I could move my ladder to the left side, remove the temporary brace, and screw the 2 x 4 into place. And here’s what it looked like at that point. I know it’s kind of hard to see with the sea of 1 x 4’s on the ceiling in the music room (that I’m trying really hard to ignore for now). But hopefully you can tell the new, lighter 2 x 4’s from the old, darker 1 x 4’s on the ceiling. And then I added another vertical 2 x 4 on each side, extending from the MDF spacer on top of the pony wall, to just under the lower horizontal 2 x 4 framing the opening. Not only did this lend extra support to the horizontal 2 x 4, but it also made the sides the correct width for the trim I’m going to add. And then finally, I added a few pieces of 2 x 4 between the top horizontal 2 x 4’s. I attached them with screws, first toenailing them into the top 2 x 4 on the ceiling, and then screwing straight through the bottom horizontal 2 x 4 and into the ends of the small vertical 2 x 4’s. These not only added some needed strength and support to those horizontal 2 x 4’s, but will also give me something to screw the drywall onto. And that’s the progress so far! Obviously it’ll take a whoooole lotta trim to get from this very roughed-in wall to the elegant pony walls with columns that I can see in my mind. But can you visualize it yet? And can you see how they’ll “frame” my rolling doors in the background? I’m so excited about this design!!! I think this will really look good. When you first mentioned it, I was a bit skeptical (imagining more of a 70’s look! ), but you’re saving it from that idea! I love building stuff and making it up as I go- I get some of my best ideas that way. I usually draw it out roughly first, just so I don’t forget something. Man! You do not waste any time!! It’s going to be amazing, I’m sure of it! It’s funny how sometimes you seem paralyzed to move forward with a plan of action because it never sits just right with you. Then you’ll change direction or have a different idea and it’s like BAM!!! Firing on all cylinders! I think this music room is going to be my favorite room in your house!! Love the doors, the stripped and studded walls and the pony walls! Can’t wait to see it finished! Are you still building columns? It just seems that there isn’t enough width for them to sit on since your pony wall is only 4″ plus drywall. Otherwise it looks really great and great job putting it together. I absolutely LOVE LOVE LOVE the doors. They are going to be the star you see when you walk in. My favorite thing. BTW I was really looking forward to those black dining room walls. They were gorgeous. Maybe in another room? Yes, I’m still using columns. If my plan works out (the one in my head…ha! ), I’ll have about 7 to 7.5 inches of width on top of the pony walls to place a column. 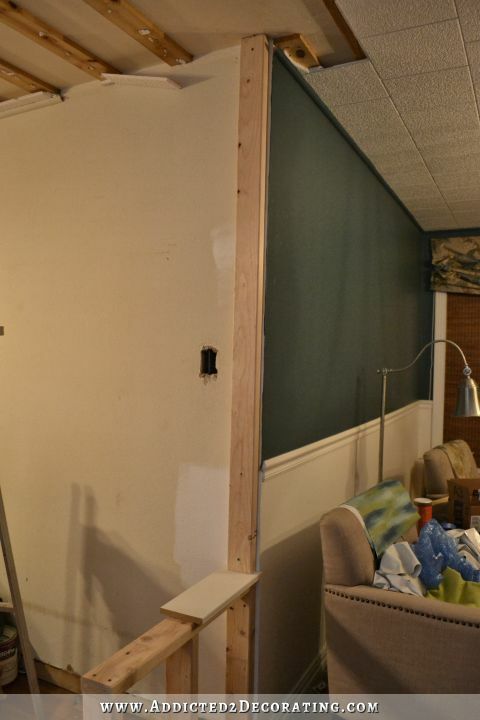 So are you still going to do wainscoting in the living room? Will it be the same height your chair rail is now? I just see a weird design thing happening with your low pony wall and your wainscoting right next to each other at different heights. I actually go back and forth on the wainscoting idea, but if it came down to a decision between low pony walls or wainscoting, I’d choose the low pony walls. Higher pony walls would make things feel too closed off for my liking. I was hoping the top opening was going to be glass like a transom. Love that look. There’s not enough room. With the way I’m trimming out all of my doorways and cased openings, there’s only about six inches from the top of the trim to the ceiling. And I’m afraid that if I trim this out differently from all of the other doorways and cased openings in the house, things might start to look a bit too busy. This will look fabulous! How deep is the pony wall going to be? And the columns, what are the dimensions? LOVE IT!!! And I love how you visualize something and then just make it happen! It’s going to look wonderful! Love it! Much more open and it visually doubles the size of the space. Love your ideas and the fact that, like you, I usually work alone and you include tips on how to manage without that extra set of hands. This is going to look wonderful. I love it. And it will keep your frustration with the ceiling at bay for a short while. This is a much better idea than the one for filling up your tiny hallway. This is going to look wonderful. I love it. And it will keep your frustration with the ceiling at bay for a short while. We did this between our dining and living rooms and I love it! It’s so good to see how it goes up from start to finish! Go, girl!! Kristi, I am loving seeing your pony ways start to take shape! Your renovations give me lots of inspiration for how I want to renovate the home we will be moving into this summer! I love the progress; what’s going on with the ceiling repair? 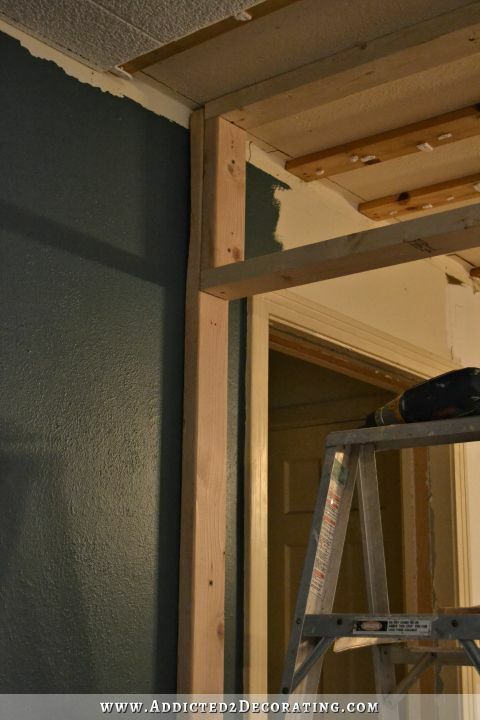 Are you getting ahead of yourself by putting up the wall framing? The ceiling repair is stalled right now. I had another drywall guy come give me an estimate two days ago. His prices were outrageous (and that was with me doing all of the tear out, bagging up debris, hauling away debris, and removing all of the nails from the ceiling joists). I have one more guy coming today. The new wall shouldn’t affect the ceiling at all. 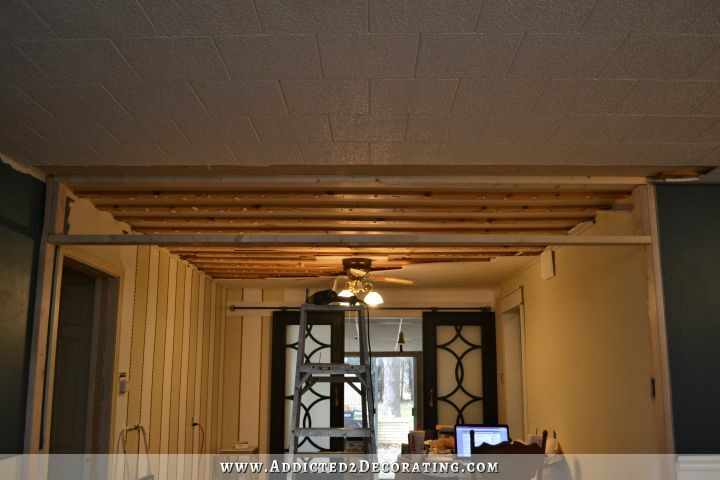 From my experience in the hallway and the kitchen, none of the drywall comes off easily around the edges of the room where the ceiling meets the walls because they put the ceiling up first, and then drywall the walls. So it takes quite a bit of work to get those edges cleaned up for new drywall anyway. So while cutting the existing drywall away from the new wall will add a bit of extra work for whoever does the ceiling (whether me or a contractor), it won’t add much. And my being able to go ahead and get this major project done while I’m waiting to figure out what to do with the ceiling is well worth any minor amount of extra work I might be causing myself with the ceiling. Kristi, thanks for taking the time to respond to my comment; I should’ve known you were on top of all the phases involved. Sure wish I knew someone to recommend for doing the drywall for you. Good news is that people are working again; bad news is when you need them at your house and they are so busy. Hang in there! DD’s boyfriend got a quote recently for a small drywall repair maybe a foot square – it’s just a dent in the wall! – and he was quoted $500!!! There MAY have been another small repair also included, but jeez!! Gorgeous already! I’m so excited too…can’t wait to see it done, although I enjoyed seeing the process. Wow! When you finally make a decision, you go with it!! 🙂 You can get an awfully lot done in one day, makes me jealous! 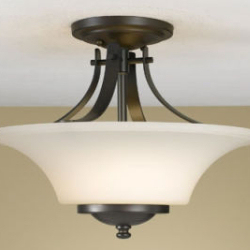 Off topic of your pony walls….I noticed the floor lamp in the background of one of your pictures. I have been searching for one I really like and this may be it! Do you remember where it came from??? Wow, you sure don’t waste any time when you make a final decision! Love how it looks already and agree that the low walls will make the room much more open and airy. Wish I had a spot in my small cramped house to add pony walls to, have always loved them! Great work and can’t wait to hear what type of columns you decided to go with. Looks great! You did an awesome job doing that all by yourself. Girl, you beat all! It seems you get an idea and the next day, you’re actually executing it. I have to mull things over a bit, and I’d never have the nerve to tackle something like this anyway. It’s going to be beautiful. I love this..I was thinking the music room looked like more of a large hallway than room but this gives it that room definition with out closing it off. I can’t wait to see the finished product! Would love to see that top portion into some sort of see-thru transom, maybe with some decorative metal/wood/glass? This is going to make a nice entrance statement! Anxiously awaiting the outcome! Unfortunately there’s not enough room. 🙁 Once I get this trimmed out like all of the other doorways and cased openings, there will only be about six inches of space between the top of the trim and the ceiling. And I hesitate to trim this out differently than the others because I’m afraid things will start looking way too busy. I see the problem. Dang! But it’s going to look really great. I forget that your ceiling is 8′. I think this is such a great idea for this room. I love the open concept and so wish l could take down some walls in my home. Watching you transform yours is at least fulfilling that itch some! I love it!!!!!! What I like about you is that when you put your mind to something there is no fooling around – you jump right in there and get it done! Awesome! 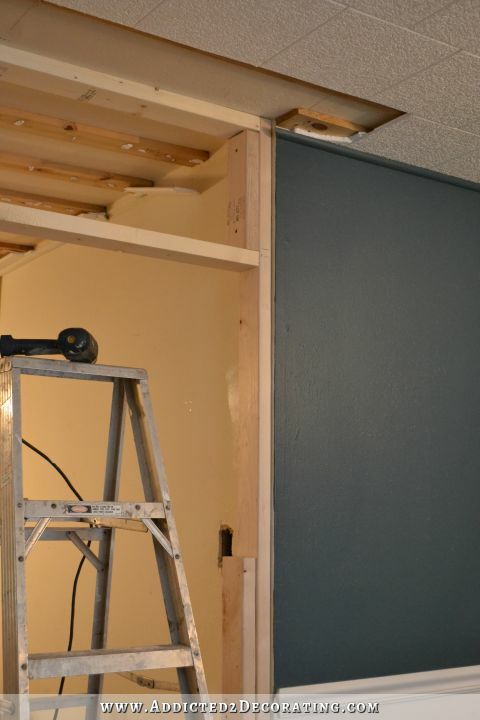 another sliding door… Going to look absolutely fab!!! Great job, Kristi! When you get the “right” idea, you jump right in. Love that as I’m the same way! I love you Kristi! If you weren’t married to Matt and I weren’t married to Fred and you and I weren’t heterosexual, I would marry you! I like it when you take your plan and run with it. Good for you! It is going to look great. I like it when you take your plan and run with it. Good for you! It is going to look great. I have missed your working posts! Great start to a terrif project! 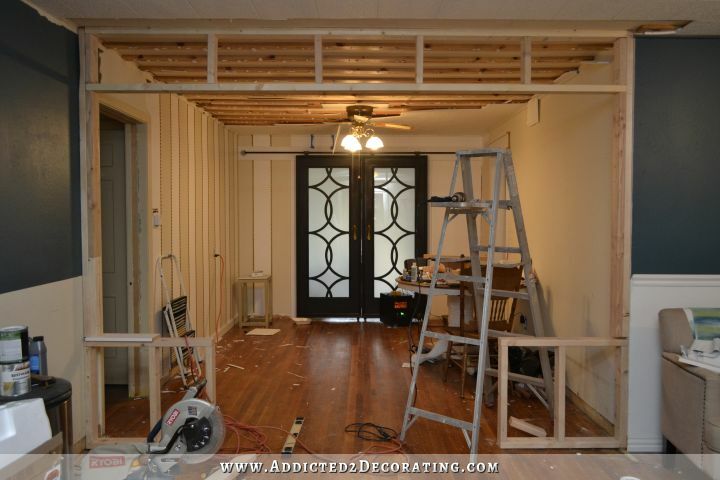 Kristi that is going to look so amazing, what a great definition between rooms. Can’t wait til it’s finished. Very cool! Please also share your process as you shop for columns! Woohoo! You sure don’t waste any time, do you? ‘-) However, I had envisioned more wall on either side; are you going to do that, or just leave it as you’ve shown here? 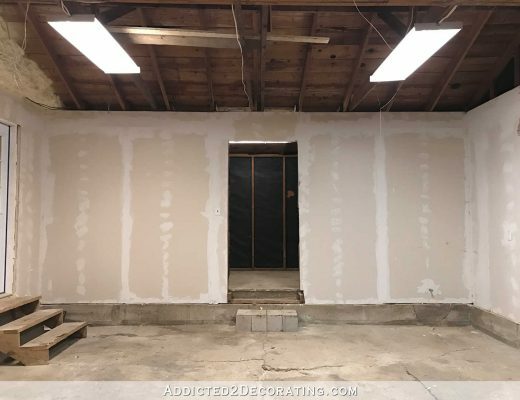 Will you just drywall around the side 2×4 framing? Whichever, you are do impress me with your ‘git ‘er done’ attitude. You go, girl! wow! you wasted no time getting this project started. I think it will look fabulous and classy. I do like the rounded ones better but it’s your home and your design so have at it, girl! You are just amazing in my book, anything you set out to do always comes out great. I remodel (in my mind) vicariously through you. I really like what you’re doing. The pony walls will give you the definition you want without closing things off from each other. On another subject, did you get the condo on the market? This is the kind of post I LOOOVE to see when I open your blog each morning. When you surprise the heck out of us. Yesterday you told us you thought of putting in pony walls and today they are halfway up… So fun!!! You make me laugh! You are like a dog with a bone. You latch onto an idea and off you go, no matter what else is in the works. Are the bottoms of the walls going to have any depth? I thought the walls would be wide with the posts on top. I guess I am confused and should just wait till you do more. Blessings. This is going to look amazing when it’s all finished. I can actually visualize it right now with those love doors in the background. Sweet baby Jesus! Just the other day weren’t you creating mind-blowing walls with tape, paint and nail heads?!? I may have missed something…maybe another post, but why are you doing the pony wall? The reason that I ask is that the pony wall seems to be kind of low and I’m not sure that it accomplishes anything. Would it be better if the area was just open?? Just a thought. By the way, I love love love the wall treatment..the only question that I have is what do you plan to do with the board that holds the mechanisms for the sliding doors. 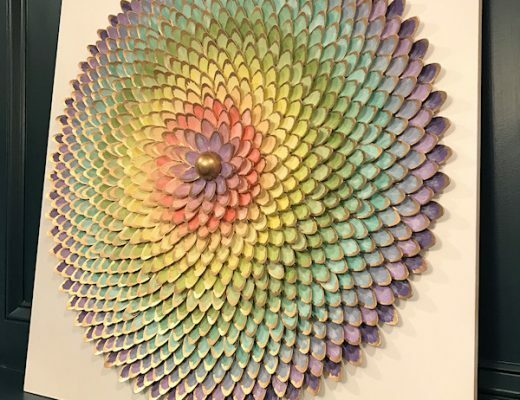 Can you apply the wall treatment to that board so that when you look at it, there is no interruption in the design? OMG! Yes, I did miss a post. I can’t believe it. Now I get it!!!!!!! I love the pony/column idea! I can’t wait to see how it turns out. Ignore my first comment…I was out of my mind. I think is going to be a fantastic addition to your room. I love how it frames your gorgeous doors. Can’t wait to see the finished project! You are so great at writing descriptions of what you are doing and why you’re doing it the way that you are! You have such foresight to envision all of these amazing projects. I’d never heard this style of architecture referred to as “pony walls” but had seen it. I don’t know how you do it and mostly without another person helping. As always, you continue to amaze! I was almost as disheartened as you were about your music room ceiling as I read about your dilemma. I’m learning so much by following your blog. Love, love, love your kitchen! I really like how this frames out your rolling doors. I can imagine it in my mind. Will you be able to just get 1 post and divide it in two? That would be a savings of some $$$. Hi Kristi & Happy New Year! 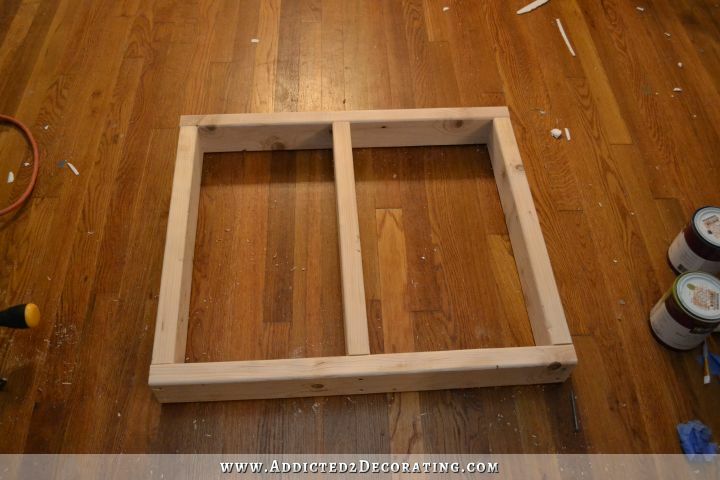 I love the pony wall idea…the rolling doors will look even more beautiful as they are framed by the pony walls. Have you considered incorporating the circular design into the pony wall faces? Did you consider putting a glass transom window instead of drywall to case the opening from the ceiling to the 82″ dimension? That’s going to look stunning – I don’t think you could have come up with a better design!!!! 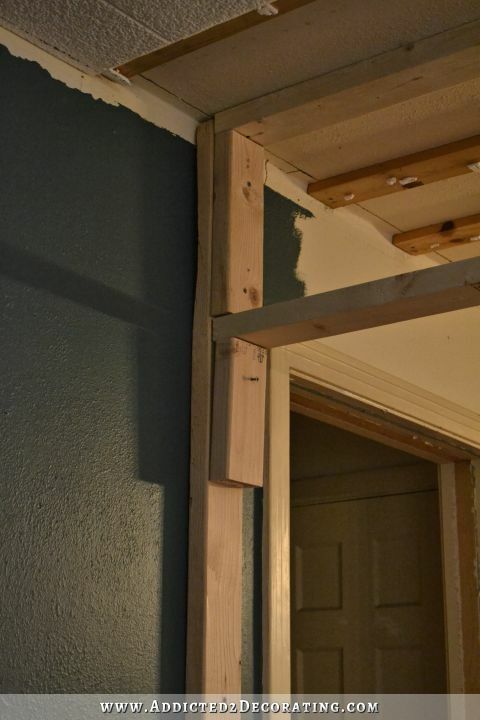 What spacing did you use for the short vertical 2×4’s above the opening? Did you use standard 16″? Just wondering in case you (or someone else) needs to find a stud. I think this is going to look great. Plus it will give you a bit of privacy by the entrance hall to your bedrooms, when the front door is opened. Here in the UK very few houses have front doors opening straight into the main rooms, we tend to have poky hallways that serve very little purpose as they’re so impractical, but do shield the other rooms from potential prying eyes at the front door. So I’m glad you’re building something to break the space up. I think this will bring in so much character into your living room & show off your sliding doors. Just like you said, it will be like a presentation of the beautiful doors. I love the idea. Perfect for your house. Can’t wait to see it done. I think the view from the entrance is going to be really lovely, but I still don’t get the width of the walls. I thought pony walls were pretty wide so that the columns hand something to sit on. Are you just building a short trimmed out wall and then having your columns be more rectangle than square? REally confused. Blessings. Hopefully it’ll make more sense as I get more done. 🙂 It’s just easier to do and show, rather than to explain. My goodness! Clearly I’ve missed a lot going on. 🙂 I’m learning lots – I had no idea what a “pony wall” was – I didn’t know what I was going to find going on in this post. I love your stripes and nail studs (love the shine and texture of that gold stripe), and I like how you are focusing the viewer’s eye on your sliding doors. Re: your breakfast/dining room and your floor plans: I was team black walls (I guess I was the only one on it! ), so I’ll miss seeing you go in that direction. But your floor plans are very practical, and I can’t wait to see you start in on the moulding and trim in the living room.